The University is very supportive of disabled students and it is clear that living arrangements for disabled students at University are extremely important. If you have applied by the deadline specified on our website, we will try and allocate a room that meets your requirements where possible. 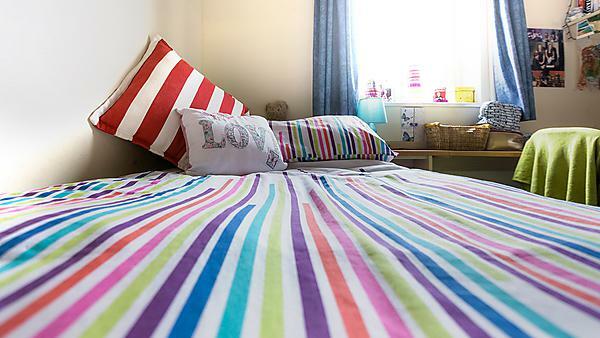 Our adapted rooms are located on our campus and Student Village halls. When completing the online accommodation booking, please ensure you list all adaptations and requirements relating to your accommodation. Please note once rooms have been allocated, it is very difficult for us to consider other requirements not listed in the original application. If you are unsure, please contact us for application assistance. Disability Services is part of Learning Support and Wellbeing and is here to help with your study support requirements if you have a disability. You will need to submit medical evidence to Disability Services if required for your accommodation needs. We work closely with Disability Services, so please ensure you visit their web pages to find out more about support available and how to disclose your disability/medical information. This will enable us to work with you to consider your accommodation requirements. For example, you may require flashing lights or other alert devices for hearing loss, en suite bathroom facilities, first-floor accommodation, power assisted doors etc. Significant changes to the DSA administered through Student Finance England were previously announced. The changes have meant a rebalancing of responsibility between Higher Education Institutes (HEI’s) and government with HEIs funding and providing certain aspects of disability related support previously funded via the DSA. Additional accommodation costs will no longer be funded by DSA where the accommodation is run by the University or its agent. If you feel that you have additional accommodation costs due to a disability ie you require a studio flat (self-contained bathroom and kitchen) or en suite provision please contact Disability Services to find out how we can help you with any additional costs. We have a number of rooms which already have basic additional facilities installed and may be helpful for applicants with particular requirements. Please note these are not always available as existing students may occupy them and suitable alternative accommodation may not be available. Ground floor en suite rooms which may be suitable for residents with mobility impairments. They each have a larger bathroom with rails fitted for additional support. These rooms are in flats which have lower work surfaces fitted in the communal kitchen. Ground floor rooms (not en suite but with adapted communal bathrooms) in flats which have lower work surfaces fitted in the communal kitchen. Portable alarm systems which can be linked to a variety of rooms are available for residents with a hearing loss. Two self-contained 'care team' flats – these are not always available as existing students may occupy them and a suitable alternative may not be available. Please note the University does not provide personal care assistance. If you already have personal care support please ask your social worker or key worker for a reassessment, as your requirements may be quite different in higher education, independent living environment - for example, you may find you will need assistance with daily personal care, cooking, shopping, cleaning and laundry. We may require a professional assessment to be carried out (usually by Social Services) to determine whether we are able to offer suitable accommodation and make recommendations for minor adaptations, such as the installation of dedicated alarm systems. In the past, we have found that successful moves for students requiring personal care support can take time and requires effective liaison with external support teams. Where it is possible, please contact both Disability Services and Residence life 9 months before your intended arrival at university. For non-accommodation support, please contact Disability Services directly. If you wish to discuss the provision of accommodation and support you require while living in halls please contact the Accommodation Services or Disability Services for a meeting or telephone discussion. Accommodation Services : email residencelife@plymouth.ac.uk, tel: +44 (0)1752 588644. Disability Services: email ds@plymouth.ac.uk, tel: +44(0)1752 587676.